Snowy conditions slid the Oscar Meyer Wienermobile off the road near the intersection of Pennsylvania Route 944 and Fairview Avenue in Enola, Pa., today. 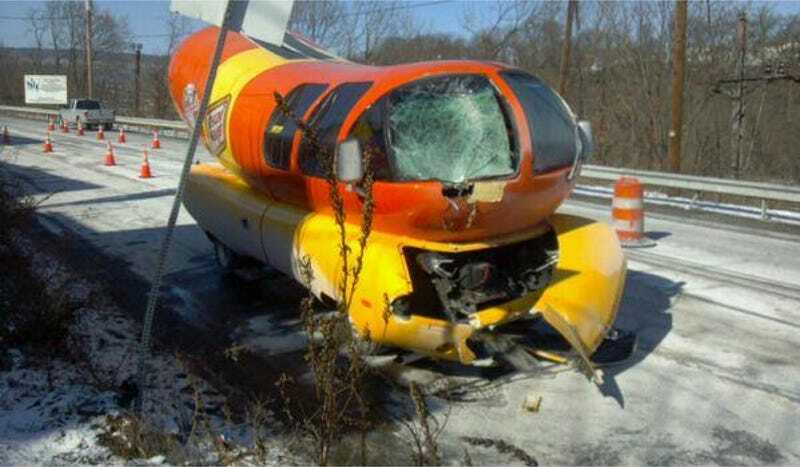 This isn't the first time the giant wiener has fallen prey to white slippery substances on the road. Although everyone's favorite bun-mounted tube-meat appears to be in scary shape from hitting a pole to the side of the road, fortunately, no injuries were reported. Due to the fact that the snowy road surface of Route 944 was as slippery as the ground underneath a coolant-spewing Porsche 944, the accident probably happened at a relatively slow speed.